The spate of sectarian violence in parts of Myanmar (Burma) between the majority Buddhist and minority Muslim populations is not covered very often in the Western media, but it has affected tens of thousands of people in Myanmar’s Rakhine state. 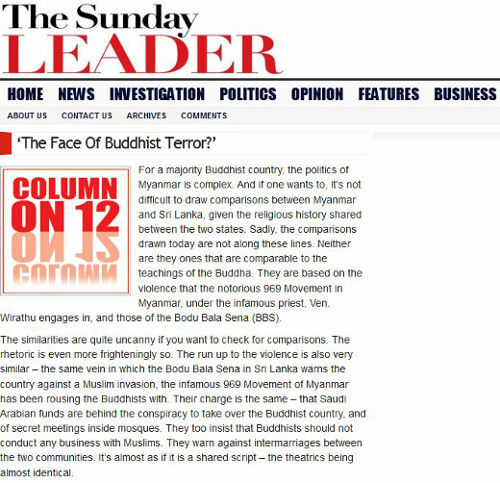 Sri Lanka is another country with a majority Buddhist population and one if its newspapers looks back at how one of the recent Burmese violent episodes began and how similar scenarios of violent clashes simmer under the surface and have even occurred, though at a smaller scale, in Sri Lanka. When 45 year old Aye Aye Naing, a Buddhist woman from Pyon Kout in Myanmar went to a Muslim shop to pawn a gold hair clip on March 20, 2013, it was unlikely that she thought the transaction would be the precursor to a massacre that the country witnessed barely 24 hours later. Is this terrorism or a mob induced blood lust? Or is there even a difference when thousands of innocents are killed and displaced?